Experience your meditations anytime, anywhere with the Loving Meditations App. Loving Meditations are delivered by iOS app and Android at healthcare facilities or at home, and use mindfulness-based stress reduction (MBSR) practices. 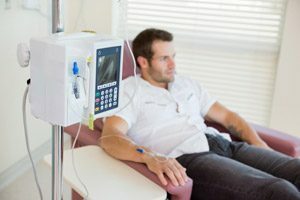 Imagine you’re sitting in the infusion center hooked up to a cocktail of IV medications. You are expecting to be sitting there for a few hours, anticipating discomfort and with time on your hands. Then you remember you have the Loving Meditations app on your device. Finding the right meditation is as simple as opening the app and answering a few questions with the Adviser feature which quickly guides you to helpful programs. Next, press play and enjoy the meditation. Close your eyes and zone out or watch the beautiful images on the screen. Available on devices including Android, iPhone or iPad.